As I was mindlessly scrolling through Instagram last week (New Years resolution: do less of that), I came across this quote. “People are so worried about what they eat between Christmas and New Year, when what matters is what they eat between New Year and Christmas.” It got me thinking about my own past behavior, namely, gauging myself with sweets and alcohol in that coveted vacation week—only to go to the other extreme, a juice cleanse, in the days after as an attempt to negate my poor eating choices. This type of seesaw eating is not only unhealthy, but also extremely anxiety provoking. As I’ve gotten older, I’ve curtailed these periods of “extremes” for a healthy balance somewhere in the middle. I try to mostly eat a diet of whole, unprocessed foods, focused on ample vegetables, whole grains, lean proteins, and healthy fats. I generally stay away from excess sugar. When I indulge, I don’t get hung up on it. I treat that as “sometimes” behavior, and move on. Apropos to this mindset, my early January diet won’t be a frantic attempt to reverse any immoderation from the past week. Rather, it will be a reset back to middle ground; looking at the future instead of dwelling in the past. 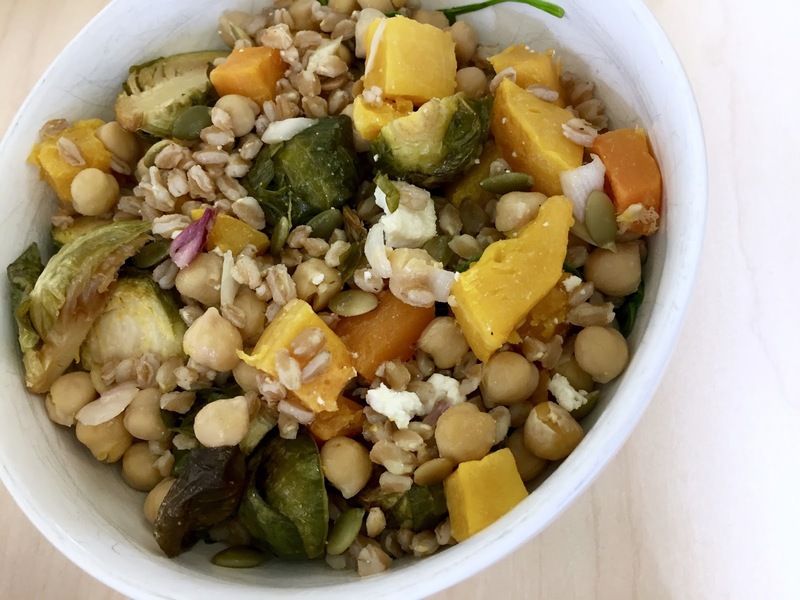 This Butternut Squash Salad with Farro and Pepitas was my first recipe of 2018, and I’ve been eating it with gusto all week long. 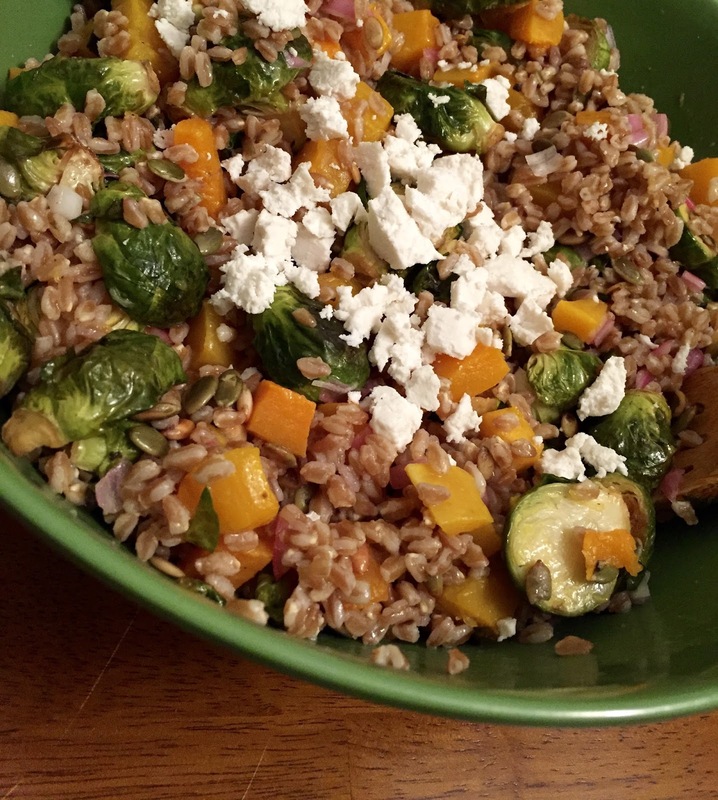 Shocker to nobody: I don’t think I’ve ever met a farro salad with roasted vegetables I didn’t like. That being said, the number of times I’ve encountered one which wildly supersedes its predecessors is scant. This is one of those rare occasions, and the winning ingredient is most surprising. It’s… the onions?! Here, while the farro cooks, finely chopped red onion is quick-pickled in a simple brine of vinegar, water, salt, and sugar. Then, the entire concoction—brine and onion bits—is poured into the salad for a lovely acidic tang that hits on all seasoning notes. 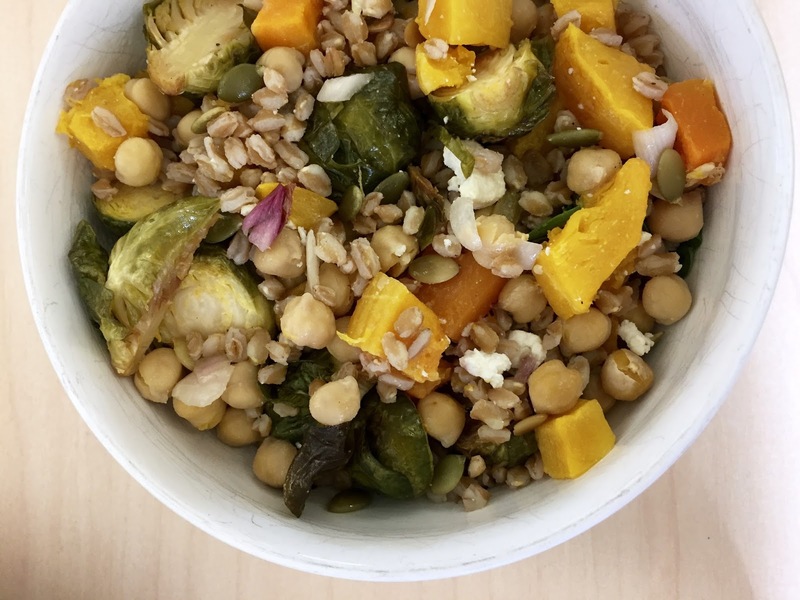 Without this dressing, the grain and squash combination could easily feel too earthy, even dull. But the pickled onion adds sprightly vim, enhanced further by dots of crunchy pepitas and silky, heavenly ricotta salada. To the original recipe I added Brussels sprouts and garbanzo beans, and cut back on the olive oil and crumbed cheese per my personal preference. These changes are reflected below. While I encourage you to consume this salad upon completion, I will say it is the kind of dish that tastes even better with time. I’m on my fourth day in a row of eating it for lunch, and the flavors have never been better. 2. Peel squash, then halve lengthwise and scoop out seeds. Cut squash into approximately 3/4-inch chunks. Coat one large or two small baking sheets with 2 tablespoons oil total. Spread squash (and Brussels, if using) out in single layer on sheet. Sprinkle with salt and freshly ground black pepper. Roast until pieces are tender, about 30 to 40 minutes, turning them over halfway through the cooking time. Set aside to cool slightly. 3. While squash is roasting, cook farro in a large pot of simmering salted water until the grains are tender but chewy, about 30 minutes or per package directions. Drain and cool slightly. 4. While squash/Brussels are roasting and farro is simmering, in a small bowl, whisk together sherry vinegar, water, 1/2 teaspoon table salt and granulated sugar until sugar and salt dissolve. Stir in onion/shallot; it will barely be covered by vinegar mixture but don’t worry. Cover and set in fridge until needed; 30 minutes is ideal but less time will still make a lovely, lightly pickled bulb. 5. 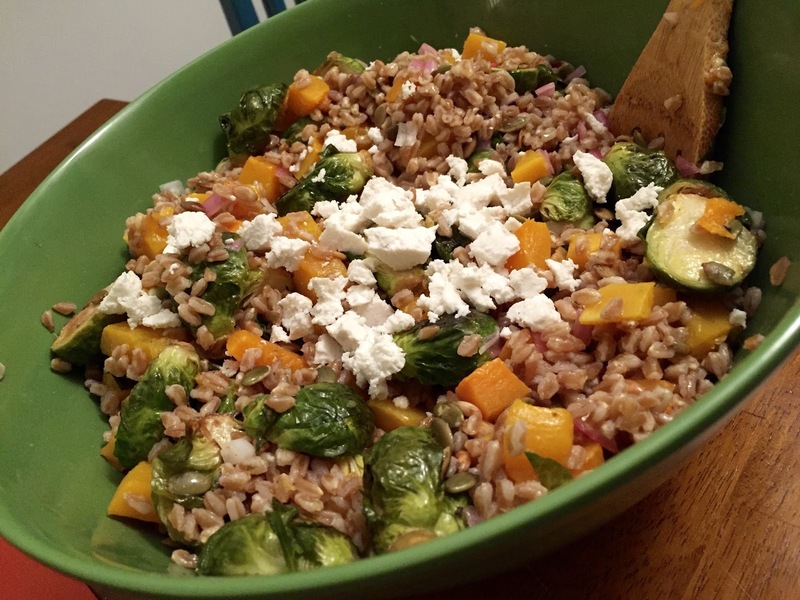 In a large bowl, mix together roasted veggies, farro, red onion and its vinegar brine, the crumbled cheese, pepitas, and garbanzos, if using. Toss with 2 tablespoons of the remaining olive oil. Taste and adjust seasonings (you might want to add more vinegar). Salad keeps in the fridge for up to a week.